Home»Android » OnePlus News Daily Dose #51: OnePlus 7 wireless charging, launch date, Game of Thrones and more! Umm… do you guys notice that we are on the 51st entry of the daily dose about OnePlus related news? We actually crossed the 50th mark! Hurray! The journey started in the evening of February 9, and we mostly talked about the mysterious MWC 2019 invitation from OnePlus and the Product Manager challenge (#PMChallenge) organized by the global OnePlus community. Readers may recall the completion of the #PMChallenge and the awesome winning entry created by Léandro Tijink, who goes by the handle Its.Leandroo in OnePlus forums. I'm excited to be the winner of the #PMChallenge made by @oneplus ! There were some unfortunate controversies around the selection process, however the OnePlus community proved its strong existence by making the whole initiative a grand success. Keeping a close connection with the user base is one of the prime reasons behind the success of the Shenzhen based OEM. The Open Ears forums, for example, is an effective way to reach to the grass root level. After San Francisco, US OnePlus fans got another chance this year to give direct feedback about OxygenOS. This time, they brought the event to the NYC. This year’s forum will focus on the OxygenOS experience, specifically for devices in our market. It will be held on April 13, in New York City. Applications are open to all US residents. We plan to select up to 30 participants this time. As we particularly want to reach out to users in our area this time, some spots will be accordingly weighted toward users from the tri-state area. OnePlus staff member Ruby G. and Community Consultant dsmonteiro shared a sneak peek of the NYC OEF, and assured that the the proper coverage would be live ‘soon’. 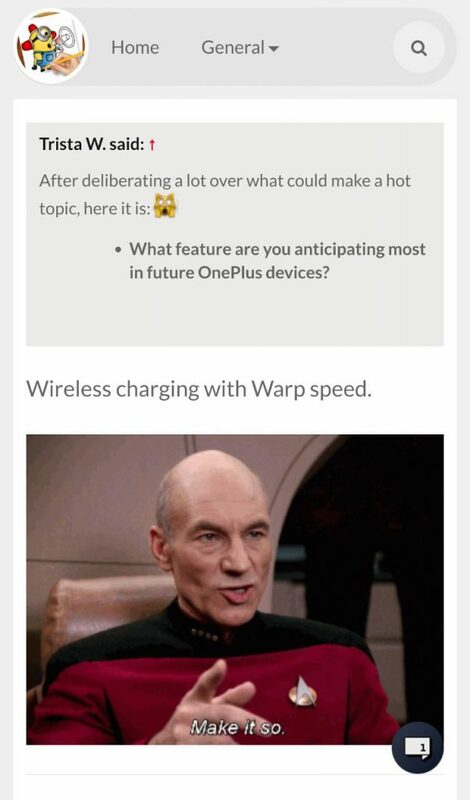 Meanwhile, OnePlus Global Community Manager David Y. accidentally opened a can of worms when he mentioned wireless charging (with Warp speed) as the most anticipating feature of the future OnePlus device. In a previous interview with CNET, OnePlus CEO Pete Lau suggested that the current fast wired charging (Warp Charge) should be preferable over wireless charging due to superiority. But considering David’s answer as a clue, are you going to see wireless charging in the upcoming OnePlus 7? OnePlus 7 won’t bring you wireless charging. The company is working to make the wireless charging experience faster. Anyway, leakster Ishaan got something really interesting about the OnePlus 7 – to be specific, the release date! Ishaan previously leaked a truckload of information regarding the OnePlus 7 variants (a ‘Pro’ version is coming alongside the 5G model) as well the model numbers. If his newest leak is true (they usually are :P), then we have less than a month left before the release of the OnePlus 7 lineup! He also hinted that the India launch will take place in Bangalore, however the source behind this news is a little bit unreliable. In another part of the globe, OnePlus CEO Pete finished his tour in Italy. We mentioned about his meeting with students of Milan’s European Institute of Design (IED) in daily dose #49. Oh, and this time Pete is curious to know the app preference of you that can be launched via the Quick launch shortcut (long press on the in-display fingerprint sensor). Something about out of the box Google Assistant integration in OnePlus 7? Time will tell.